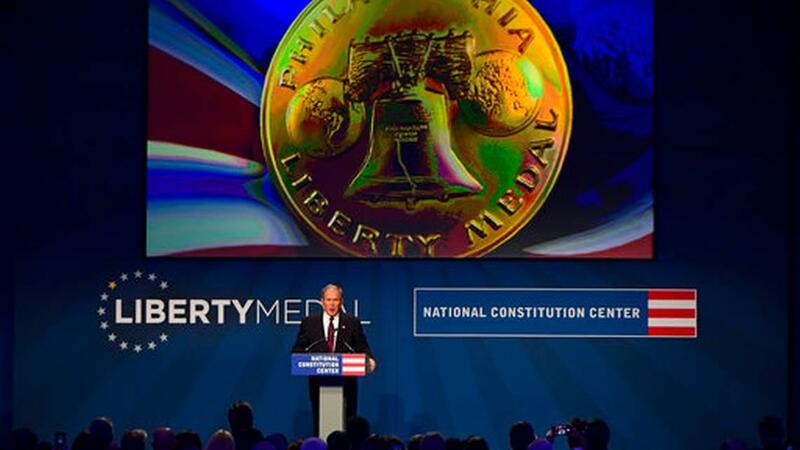 Former President George W. Bush and former first lady Laura Bush received the Liberty Medal on Sunday at the Constitution Center in Philadelphia for their work with veterans, reports CBS Philly. The award, in its 30th year, honors people for their commitment to veterans. "It is not about Democrats or Republicans," said former Vice President Joe Biden, who presented the award. "It's about who we are. It's about standing up for men and women who put their lives on the line to defend us every single day." "We share a belief that those democratic values are precious, they exist above party, and they have to be defended" Biden said. He also presented the Bushes with Philadelphia Eagles jerseys. A group of veterans protested the ceremony, blocking the entrance to the National Constitution Center. The group, Veterans Against the War, represents post-9/11 service members and veterans and seeks to end "a foreign policy of permanent war and the use of military weapons, tactics and values in communities across the country," according to a statement. Former recipients of the Liberty Medal award include John McCain, Hillary Clinton and Muhammad Ali.